Contains: Traces Of Cereals Containing Gluten, Eggs, Milk, Peanut And Tree Nuts. A one-step premium honey base sauce. 1) Highly versatile and easily extended into other sauces. 2) Gives food a superior coating and aromatic sweetness. 3) Time, labor & cost savings. 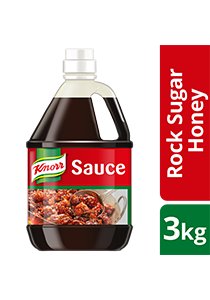 4) Uses only premium quality ingredients: Yellow Rock Sugar and Real Honey. 5) Halal certified and produced in a GMP & HAACP verified factory.